The new BMW 320d Edition Sport is locally produced at BMW Plant Chennai and can be ordered from BMW dealerships from today onwards. With the launch of the new BMW 320d Edition Sport, we go a step further in presenting a well-balanced portfolio of the BMW 3 Series. The latest generation BMW TwinPower Turbo diesel engine of the BMW 320d Edition Sport gives a thrilling power delivery and excellent responsiveness which guarantees sheer driving pleasure on the road. Agility and driving dynamics remain the outstanding disciplines of the new BMW 3 Series. The new BMW 320d Edition Sport will build an emotionally rich connection between a sporting driving experience and unbeatable everyday practicality. The new BMW 320d Edition Sport sets clear visual accents. Its striking design features in high-gloss black at front and rear reinforce its sporty look. The boldly designed kidney grille slats in high-gloss black produce an especially athletic effect for the front end. In the interior, contrasts between black and red with sports seats express the typical BMW athleticism: sporting chrome scaling at console, red contrast stitching on the sport steering wheel and gear shift paddles. In typical BMW style, the cockpit is angled towards the driver to put all controls within reach and facilitate intuitive driving. The electric glass sunroof brings in a sense of wellbeing and the 205 Watt, 9 speaker Hi-Fi loudspeaker system offers highest quality of entertainment for the passengers. As a distinctive feature of the Edition Sport, the vehicle key is designed in red decorative trim. he latest generation BMW TwinPower Turbo diesel engine features remarkably agile power delivery and excellent responsiveness, even at low engine speeds. The 4-cylinder diesel engine in the BMW 3 Series boast high dynamics and guarantee the highest possible efficiency – for maximum performance with lower fuel consumption. It produces an output of 140 kW / 190 hp and a maximum torque of 400 Nm at 1750 – 2,500 rpm. The BMW 320d Edition Sport accelerates from 0 -100 km / hr in just 7.2 seconds to a top speed of 250 km / hr. The new BMW 320d Edition Sport gives impressive efficiency of 22.69 kmpl on average, equating to CO2 emissions of 116.62 g/km. The eight-speed Steptronic Sport automatic transmission performs smooth, almost imperceptible gear shifts. For even greater driving pleasure, the eight-speed Steptronic transmission is available with steering wheel paddle shifters. At any time, in any gear, the transmission collaborates perfectly with the engine, enabling it to develop its full power and efficiency. Furthermore, the BMW 320d Edition Sport comes with a Launch Control function as standard. This easy-to-operate system paves the way for ambitious drivers to achieve optimum acceleration under all conditions. The new BMW 320d Edition Sport provides unparalleled performance coupled with cutting-edge safety technologies. BMW’s exemplary safety provides optimal support in any situation with six air bags, Anti-Lock Braking System (ABS) with brake assist, Dynamic Stability Control (DSC) including Dynamic Traction Control (DTC), Cornering Brake Control (CBC), Side-impact Protection, ISOFIX child seat mounting, Runflat tyres (RFT) with reinforced sidewalls, emergency spare wheel, electronic vehicle immobiliser and crash sensor. BMW has been setting the standard for connectivity between human, car and the outside world for many years now. 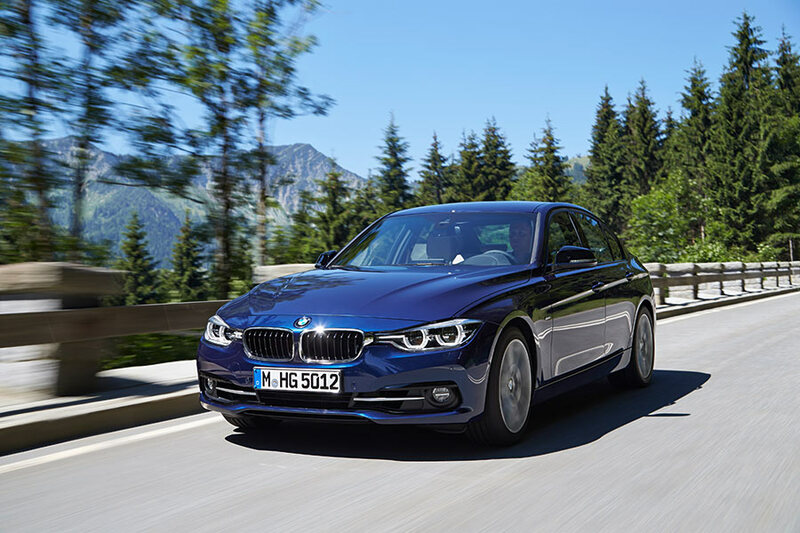 The new BMW 320d Edition Sport comes standard with BMW ConnectedDrive features such as iDrive controller and a 16.5 cms colour display with CD drive, BMW Apps, Connectivity through Bluetooth and USB/AUX IN connectivity, Rear View Camera along with Park Distance Control (PDC) Rear.